Just last week, real Banksy art was offered for sale in Central Park to an uninterested crowd, with only a few passers by unwittingly picking up signed pieces worth thousands of dollars or more. Today, a shop selling pure copies complete with a legally-notorized Certificate of Inauthenticity managed to sell forty works in less than sixty minutes to dozens of NYC buyers … they even sold the price sign. 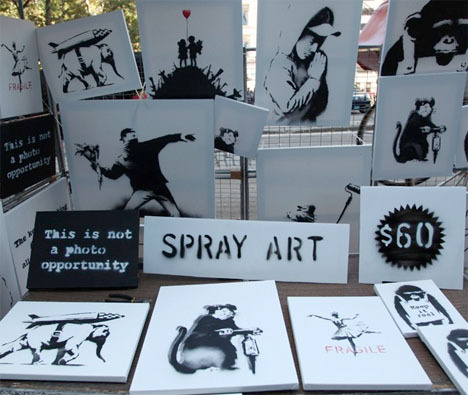 The actual Banksy sale had a dismal three customers in seven hours. This pop-up stall was set up in the same location and offered similar works for sale at an identical price. The video above tells the story well. Crowds gathered, lines formed and people stopped to take pictures – almost an exact reversal from the bored looks and barely interested buyers of the prior sale. Some people did double-takes, not sure whether it was a hoax, or another Banksy head-fake that might net them a five-figure profit. Part faux art sale, part performance art, the production made its point: the hype surrounding Banksy has bled into the public consciousness of the city, and people have gone from unaware to eager as a result. The entire ploy seems to complete Banksy’s intended message about the absurdities of originality, authorship and the art world. Meanwhile, at 60 dollars a canvass (times 40 sales equals $2,400), the creators made not just a point but a handy financial return on their time and money for future projects. Meanwhile, for those who missed the original (and real) Banksy sale, feel free to view the frustrating footage above. Many have watched it and wished they had stopped to take a closer look. Still, who knows – perhaps with a limited run of 40, even this run of secondary knock-off works will have some street value after the dust settles on the sidewalks. At the very least, they will look just as good on your wall as the real thing.